Get Ready for SWAN Day 2015! The Eighth International Support Women Artists Now Day/SWAN Day will be celebrated around the world on Saturday, March 28 and throughout March and April. This is a grassroots "do it yourself" holiday, and everyone is invited to join us in honoring women's creativity. There are no fees or application forms required to participate in SWAN Day. If you decide to create a SWAN event or if you are doing any event in March or April featuring women artists, we invite you to create a free listing on our official SWAN Calendar. We will be featuring SWAN events in the WomenArts Blog and newsletters over the next three months. If you want us to write about you, creating a listing in the SWAN Calendar is the best way to let us know about your event. Organize Arts Events for SWAN Day - There have been over 1,200 SWAN Day events in 24 countries in the past 7 years. Join the fun by organizing an event in your community! Your event can be a performance, exhibit, rally, parade, workshop, or any other activity that draws attention to women artists or raises money for women artists in your community. To post your event on our website, please visit our SWAN Calendar and then click on the link labelled “Post Events” at the top right of the SWAN Calendar page. We have posted Publicity Tools and Fundraising Tools to help you organize your event, and you can download our official SWAN Day logo. If you have questions, please feel free to contact us. Host a SWAN Day Party – Gather friends at your house to talk about ways that you might help the women artists in your community. Invite local artists to speak at the party or use the WomenArts Network to find artists that you would like to support. If you want to find films written and directed by women to show at your party, you can check out our page of Websites with Helpful Information about Women in Film. Donate to Your Favorite Women Artists – If you love seeing the work of a particular woman artist, send her a check on SWAN Day to help her make more art. If you are having a gathering, ask everyone to contribute some amount of money and then make a group decision about which women artists you want to support. Introduce Students to Women Artists in the US & Elsewhere – If you are a teacher, tell your students about SWAN Day and introduce them to women artists! Use the WomenArts Network, our list of Directories of Women Artists, or other sources to find local women artists you could invite to your classes. Start Wearing SWAN Shirts, Jewelry and Other Items - Show your support by wearing shirts, jewelry and other items featuring swans. When anyone asks you, tell them you are wearing swans because you want to see more art reflecting women’s perspectives. These casual conversations are a great way to make people more aware of the discrimination faced by women artists. We have SWAN shirts, hats, and mugs available in the SWAN Store at: www.cafepress.com/womenarts. "She's Beautiful When She's Angry"
WomenArts highly recommends She's Beautiful When She's Angry, a film by Mary Dore and Nancy Kennedy about the birth of the women's liberation movement in the late 1960s. The film reminds us that in those early days of the National Organization of Women, ladies still wore hats and gloves, abortions were illegal, and lesbians were outcasts. 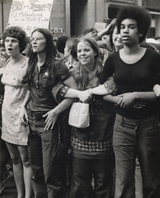 Through interviews with leading feminists of the period and archival footage, the film chronicles the wide-range of women's liberation activities in the late 1960s - feminists in academia, women’s rock bands and poetry, underground abortion services, lesbian activism, the first edition of Our Bodies, Ourselves, and a variety of other protest actions. The film features interviews with Kate Millett, Fran Beal, Rita Mae Brown, Karla Jay, Susan Griffin, Alta, Judith Arcana, members of the Boston Women's Health Collective, and many other feminists of the period. The film opened in the San Francisco Bay Area this week. Please visit the film's website to find screenings near you or to watch the film's trailer. Women in Arts and Media Coalition in collaboration with WomenArts and the League of Professional Theatre Women is publishing free newsletters for theatre and film/video artists listing submission opportunities, grants, auditions, residencies and more. Click the links below or follow the #StageOpps and #ScreenOpps tags on Twitter. There are links at the bottom of each funding newsletter which will let you sign up to receive them by email. Theatre Artists - You can see the current issue of #StageOpps (formerly the Theatre Funding News) by clicking here. Film/Video Artists - You can see the current issue of #ScreenOpps (formerly the Film/Video Funding News) by clicking here. To Submit a Listing - To submit a listing for the #StageOpps or #ScreenOpps newsletters, please visit the Women in Arts and Media Coalition's Submit a Listing Page.